Three simple strategies to get you become more present. Although we live in a world inundated with media, e-mails, data, text alerts, and advertising, we do not have to succumb to being enslaved by it. We live in a 24/7 society, from a minute-by-minute news cycle to the unending social feeds that our naturally inquisitive brain has grown accustomed. 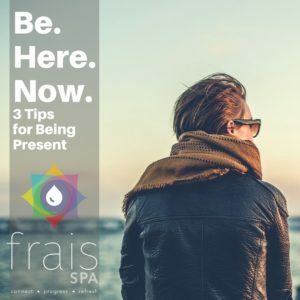 Here are three ways to enjoy life becoming more present. 2,617. According to a recent DScout study, that is the average number of times we touch our smartphone every day. Those instances can be fleeting; like that incoming text message vibration, that you just felt. It could also be those several lines of text messaging you just typed out rather than just speaking to that person directly. Imagine how each of these instances has broken your train-of-thought and possibly made you alter your focus or activity. Follow these three simple strategies that will help you continue to be more present. Charge your smartphone outside of your bedroom. Try guessing what activity do most Americans do first thing in the morning…. reach for their smartphone. Instead, reach for your journal. Write down what you are most grateful. Make your first waking thoughts, positive ones. This will teach you to not think of the stresses ahead of you but ensures your gratitude of the many things to be grateful for now. Make a phone call just to say hi. We are social creatures that thrive on social interactions, not just 140 characters. Did that friend just tell you they’re in the middle of something or did you get their voicemail? Just tell them you were thinking of them and just wanted to say ‘hi.’ Imagine how you would feel receiving such a simple gesture? Take TEN minutes out of your 1,440 minutes in a day to disconnect. Disconnect from your devices, tv, media, music, and radio chatter. Even short duration meditation has been clinically proven to have profound physiological benefits for those who practice it regularly. 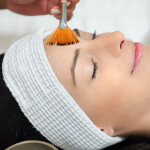 Along with a regular dose of massage, you will continue to feel less tense. Imagine a hurricane from a satellite image. The first thing that attracts your attention is the immensity of the size and force of the whirling 120+ mph winds. Now imagine the eye of the storm. Sometimes not even a slight breeze, but always very calm. Imagine yourself as that EYE OF THE STORM. As you become more present, no matter how violent those winds are, you will be calm and present to whatever life brings you.